Not Registered for the Pray More Retreat? Click here to Register and receive more talks like this one! 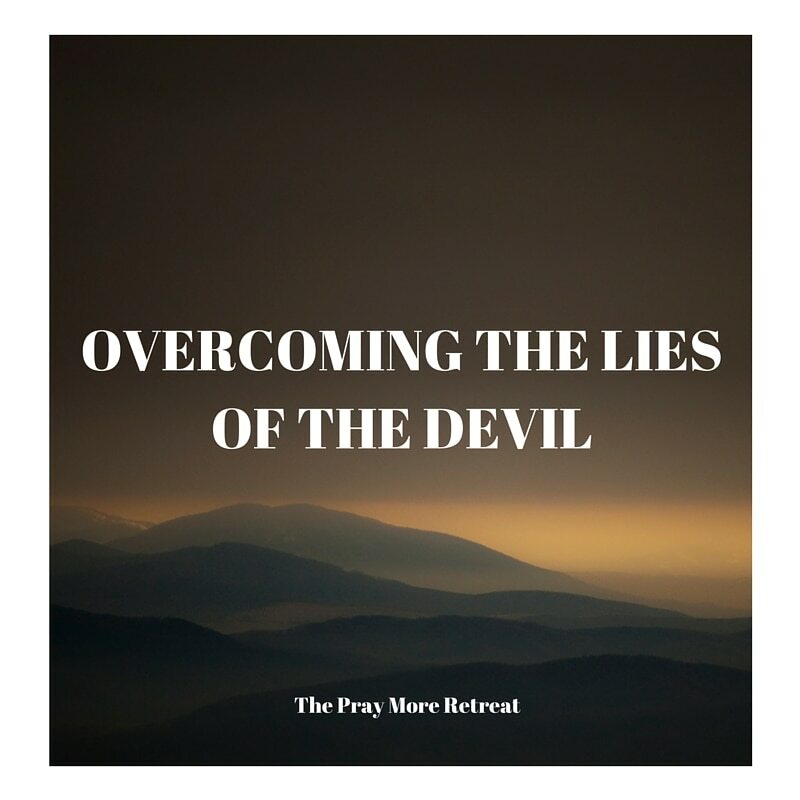 Click here for the printable study guide for Overcoming the Lies of the devil. Two of the temptations that Jesus experienced in the desert were the temptations of power and honor. How are you tempted to both in your life? And how can you pray about these temptations, surrendering them over to God, asking for Jesus Christ’s help to overcome them? The devil wants you to dwell on regrets of the past or to dwell on fears of the future. Can you think of times when regrets and/or fears of either overwhelmed you? In those moments, now, what can you do to remain present in the moment where God is? Jesus makes all things new. Try to remember this the next time your day gets off to a wrong start, or whenever you begin to feel bogged down by your temptations or sins. No matter what time during the day, God makes all things new and can give you a brand new beginning. What lies are you holding onto that may be lies of the devil? How do they contradict the truth and love of God? These could be lies about who you are, what God thinks of you, and even lies about who God is. Once you identify the lies you’re holding onto, and remember the Truth as it exists, you’re now called to embrace the Truth. What can you do to not go back to holding onto those lies of the devil? Father Anthony Co grew up in the western suburbs of Chicago. While completing his studies of philosophy and Eastern religions at the University of Illinois in Champaign-Urbana, Fr. Anthony received his calling to the priesthood. Immediately after graduating from U of I, Fr. Anthony entered Mt. St. Mary’s Seminary and for the next five years he prepared for Holy Orders for the Diocese of Peoria, IL. 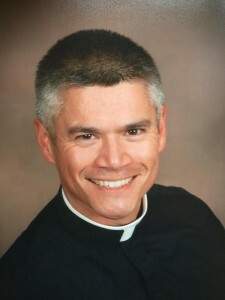 He was ordained to the priesthood at St. Mary of the Immaculate Conception in 2005 and offered his Mass of Thanksgiving on the Solemnity of Corpus Christi. Father Anthony has served throughout the Diocese of Peoria, ministering to college students and various parishes. He is now pastor of St. Patrick’s Catholic Church in Andalusia and a college chaplain. knows that He wants us to be safe and protected. same location where most of the people in my town in the west suburbs are from. “You know, nothing is going to change”. and all this misery that takes place in this world. of the cocaine came to our country from that cartel. met somebody. He met Jesus and it absolutely changed his life. likely going into gang activity. Amazing! methods that the devil uses. And then finally, some of the ways we can thwart him. You know, think ahead and get away from his traps. tempts him in three specific ways. and Jesus says, “No I won’t do it”. so he wanted to follow the way of God the Father and not of the Devil. says], “No, I will not do it”. world! All these faithful people coming in to sacrifice to the true God. you shall not put the Lord your God to the test”. “Who do people say that I am?” Well some people say this, some people say that. “Who do you say that I am?”And Simon, son of Jonah, says, “You are the Christ”. of the netherworld will not prevail against it”. because the Devil has the opportunity to whisper thoughts into our minds. heart so that from there we make the decisions of our lives. thing that looks good from the outside. Or you get nothing. keep your job. And the list goes on. freedom that you never thought possible”. “It was completely worth it. It was completely worth it”. “No, there’s a third option; infinite love, my ways”. he will confuse you and he will distract you and find ways to do that. phone calls or whatever it is. because I’m exhausted. My mind is tired. “So, we’ll see you at 8:30”. early and then I become late because I can’t find the person and the family. It’s not their fault. It’s not necessarily my fault. Although, I feel pretty stupid. not able to offer that to God a blessing and thanksgiving. So, as these things were formulating in my head, thinking, “What a waste of time”. done, don’t worry. You’ll get your stuff done”. happens in our daily life. freedom to love God even more. then you can remember what God said. lies that you’re holding onto. Lies about yourself. “I’m not worthy”, “I’m useless”, “I’ve got bad faith”, “I’m dumb”, whatever it is. “You’re never going to love me”, “God doesn’t love me, He doesn’t care about me”. you, you hear that truth. are and set the course of your life based on that truth?”. the truth and then go forward. spiritual way. It’s a model I use in the confessional if people are interested. And when I do healing prayer and it works! They bear great fruits. and we can tell something’s not right. We’re thinking in a way that seems just off. can’t turn the impossible into the possible. That He doesn’t make all things new. to shut the door on the lie and embrace the truth”. Very simple. One thing is for certain. Jesus brings the fight. He is victorious! Him and share that love with others.